FoneWorx has been very active in the business world as of late. To read up on our latest moves and achievements follow any of the links below. This section is constantly updated, so keep checking back for latest news and happenings. Read about Cognition acquiring 100% ownership of BMi Research. Read about Cognition's changes that are part of a broader transformation. Read about FoneWorx's change of name from FoneWorx Holdings Limited to Cognition Holdings Limited. Read about FoneWorx's strategy shift and the positive results it is garnering. Watch the FoneWorx results interview. View the FoneWorx results for 2014. FoneWorx is adding to capacity at its Knowledge 350 unit through the purchase of a 35% stake in BMI Research for an undisclosed amount. TECHNOLOGY company FoneWorx is "actively evaluating" niche acquisitions to complement its newly created business process unit called Knowledge 350 degrees, it said on Friday. FoneWorx has bought a 44% stake in Living Facts for an undisclosed amount, in a bid to boost the company's growth through its recently-created Knowledge 350° unit. Review the FoneWorx Interim Report for December 2013.
Review the FoneWorx Interim Report for 2013.
Review the FoneWorx Year End Results 2011.
Review the FoneWorx Annual Report for 2010. Listen to Mark Smith, CEO of Foneworx, being interviewed by Simon Brown. Once again FoneWorx proves that size doesn't count as it beats out the big dogs. Check out the photos from the day. The deal was first announced in November and will provide FoneWorx with the capital it requires to support its expansion strategy. It will also render FoneWorx compliant with the broad-based black economic empowerment (BEE) codes of good practice. FoneWorx Holdings, the telecommunications services group, said yesterday its earnings per share for the six months ended December are expected to be between 60 percent and 70 percent, and headline earnings per share between 50 percent and 60 percent above those reported for the same period in 2006. The financial results of the company will be published on or about February 27. 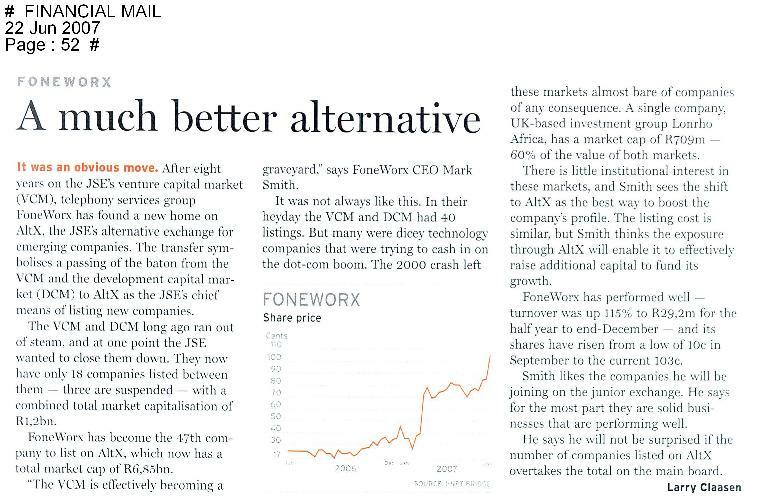 FoneWorx CEO in Financial Mail! FoneWorx gets the markets vote! Pictures of The FoneWorx Virtual Business Centre Stand at this years show. 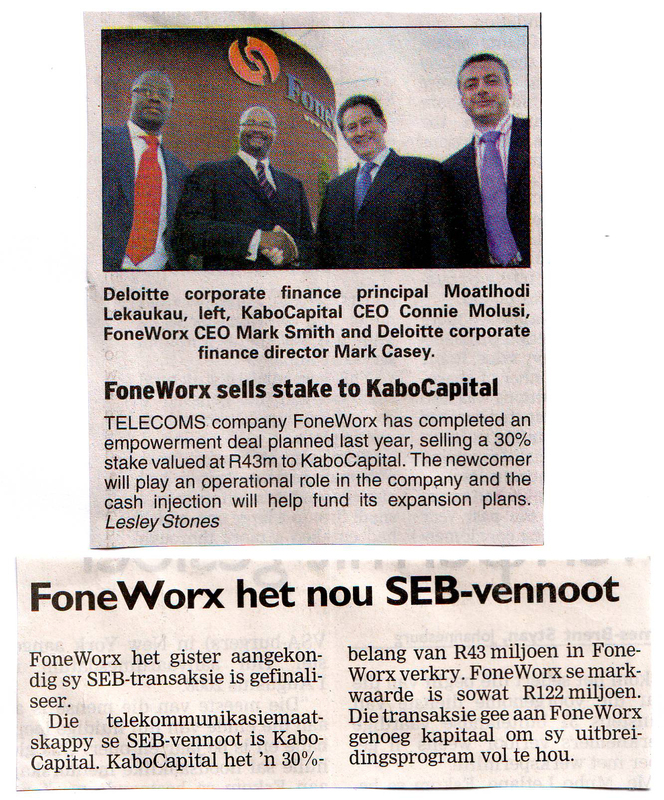 Pictures of The FoneWorx Virtual Business Centre Cars on the road..
SABC and FoneWorx in WASP Partnership! The SABC and Foneworx today announced that they would partner to establish a best-of-breed WASP (Wireless Application Service Provider) for the National Public Broadcaster. [Johannesburg, 18 April 2006] - JSE-listed Interconnective Solutions (Isolution) has acquired 40% of Internet and network services provider ALTONet. FoneWorx Launches The Virtual Business Centre! The VBC provides your business with many solutions all aimed at making your business more productive.